The Denver Broncos had made several notable changes as they opened their AFL season against the Boston Patriots on September 3, 1967. The perennially losing franchise was coming off a second straight 4-10 record in ’66 and had hired a new head coach/GM, Lou Saban, who had won back-to-back AFL titles in Buffalo. HB Floyd Little was drafted in the first round out of Syracuse and became the first top draft pick in the team’s short history to sign with the club (no doubt helped by 1967 being the first year that the AFL wasn’t competing with the NFL for draft picks). Quarterback had been a major issue for the Broncos in recent seasons, and a trade was swung with San Diego to obtain the strong-armed Steve Tensi to take over the position for ’67. The visiting Patriots were coached by Mike Holovak (who had replaced Saban when he was fired from that job during the 1961 season) and were coming off an 8-4-2 year in ’66. FB Jim Nance had blossomed into a star, setting an AFL record with 1458 rushing yards. 37-year-old QB Babe Parilli was coming off of a good season and OE/PK Gino Cappelletti was the league’s top scorer. There was a record crowd of 35,488 in attendance at Bears Stadium ready to get a look at the refurbished club that had won its last three preseason games. The Broncos got the first break of the game when a deflected pass by Parilli was intercepted by DB Gene Sykes and returned 29 yards to the Boston 13. Two plays later Steve Tensi completed a 12-yard touchdown pass to flanker Al Denson and Gary Kroner added the extra point. The teams traded punts until the Patriots came through with a big play. Parilli threw to split end Art Graham on a play that covered 79 yards for a TD. Gino Cappelletti’s PAT evened the score at 7-7. Neither team was able to move the ball effectively for the remainder of the opening quarter. On the last play of the period Jim Nance fumbled and DT Dave Costa recovered for the Broncos at the Patriots’ 28. 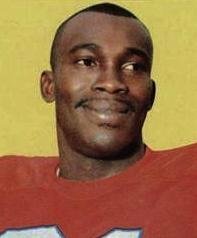 However, after advancing to the seven yard line Denver came up empty when FB Cookie Gilchrist, returning to the team after a sojourn with the expansion Dolphins in 1966, was stopped for no gain on a fourth-and-one play. The teams again traded punts until Sykes again picked off a Parilli pass to give Denver the ball at the Boston 29. Floyd Little ran four straight times to pick up a total of 16 yards and the series ended with Kroner kicking a 20-yard field goal. The Broncos were back in front by 10-7, which remained the score at the half. The Broncos extended their lead on the first series of the third quarter that was helped along when, initially forced to punt, the Patriots were penalized for roughing the kicker. Two plays later Tensi connected with Denson for a 55-yard touchdown. Kroner’s extra point try was blocked, however, and the score remained 16-7. The Patriots wasted no time in coming back, driving 64 yards in five plays. After Boston ran the ball twice, Parilli threw to TE Jim Whalen for a 27-yard gain to the Denver 24. A pass interference call gained another 14 yards before Parilli threw to Nance for a 10-yard touchdown. Cappelletti added the extra point to make it a two-point game. The Patriots got the ball back on the next series when DT Jim Hunt stripped Tensi at the Denver 37. Five plays later, Parilli passed to HB Larry Garron for a 20-yard touchdown and, with the successful conversion, Boston was in front by 21-16. Heading into the fourth quarter, the Broncos got a big play on offense when Tensi connected with Denson for a 58-yard gain to the Boston 9. Little and Gilchrist were unable to pound the ball into the end zone but Denver came away with a 9-yard Kroner field goal to narrow the tally to 21-19. Now midway through the fourth quarter the Patriots had the ball back after the ensuing kickoff but, on the second play, CB Goldie Sellers (pictured at left) intercepted a Parilli throw and returned it 24 yards for a touchdown. Kroner’s extra point gave the Broncos a five-point lead, but there were still over eight minutes to play. Parilli immediately went to the air and connected with Cappelletti for a 30-yard gain to midfield, but his next pass was intercepted, this time by CB Nemiah Wilson. The Broncos couldn’t move the ball and, on a third-and-14 play, Tensi was sacked by LB Doug Satcher for an 11-yard loss to his own 10 yard line. HB Joe Bellino returned Bob Scarpitto’s punt 17 yards to the Denver 37 to give the Patriots excellent starting field position. Garron took off for 15 yards on the first play of the series but Parilli was picked off for the sixth time, once again by Sellers. The Broncos had possession at their five yard line, went three-and-out, and Scarpitto boomed a punt that gave the Patriots the ball at their own 20 with less than two minutes remaining on the clock. They managed to reach the Denver 43 before Costa sacked Parilli for a 13-yard loss and a long desperation pass fell incomplete. The Broncos were winners by a score of 26-21. Boston had more total yards (302 to 209) and first downs (14 to 11) than the Broncos, but the Patriots also turned the ball over seven times, to one suffered by Denver. 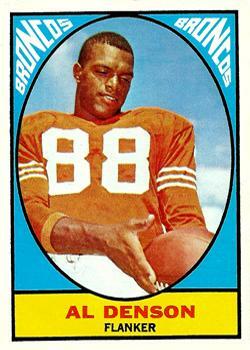 Al Denson was the offensive star for the Broncos as he caught four passes for 131 yards and two touchdowns. Steve Tensi completed 8 of 19 passes for 145 yards and the two TDs with none intercepted. Floyd Little, playing in his first regular season game, rushed for 66 yards on 25 carries, while Cookie Gilchrist, appearing in his last, gained 21 yards on 10 attempts (the talented and mercurial Gilchrist underwent knee surgery the next week and ultimately retired). Gene Sykes, Goldie Sellers, and Nemiah Wilson each intercepted two passes apiece. For the Patriots, Babe Parilli was successful on 16 of 30 throws for 234 yards and three TDs but also gave up the six costly interceptions. Gino Cappelletti had 6 catches for 54 yards and, thanks to the long scoring reception, Art Graham gained 84 yards on his two receptions. Jim Nance ran the ball 15 times for 53 yards and Larry Garron contributed 37 yards on 6 carries while also gaining 53 yards on four catches that included a touchdown. Tragedy dimmed Al Denson’s fine performance. He left immediately after the game for his home in Jacksonville, Florida due to the untimely death of his three-year-old son. The exciting win did not herald a winning season in Denver. The Broncos lost their next nine games and finished at the bottom of the Western Division with a 3-11 record. The Patriots ended up at the bottom of the Eastern Division at 3-10-1. Al Denson, a converted tight end, went on to catch 46 passes for 899 yards (19.5 avg.) and 11 touchdowns, received consensus second-team All-AFL honors (and was a first-team choice of the NEA), and was chosen to the AFL All-Star Game. Steve Tensi had a decidedly uneven year, completing just 40.3 percent of his passes for 1915 yards and 16 touchdowns as well as 17 interceptions. Floyd Little led the club in rushing as a rookie, but with only 381 yards and averaging 2.9 yards per carry as opposing defenses focused on stopping him. However, he did lead the AFL in punt returning with a 16.9-yard average. While Tensi would ultimately not pan out as a starting quarterback, Little went on to an outstanding career worthy of his high draft status.